The TOEIC® S&W test measures a person's ability to speak and write in English in the workplace environment using key expressions and common, everyday vocabulary. Speaking-only tests are also available. Daylight savings starts 6th October - ask about new times and dates. 7th April - 11am (or 3pm) DAYLIGHT SAVINGS STARTS THIS DAY! ** Sundays are not always available - $50 surcharge for 1 candidate. 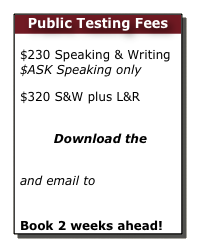 Please bundle the Speaking & Writing tests with the Listening & Reading tests. Add L&R for half price ($90) if you purchase together and test within 1 month of each other. The Official TOEIC Score Reports are the same as the Official TOEIC Score Certificates in Japan and Korea. The same certification is recognised worldwide. Chinese companies are looking for a certification in one of the global Speaking tests.